Lucerne, or alfalfa (Medicago sativa L.) is recognised as the plant which has been longest grown specifically for animal feed. Before recorded history, lucerne was already cultivated as well as growing wild from Spain to China and from Sweden to North Africa. It has also become established during modern times in South Africa, Australia, New Zealand and in North and South America. It is generally accepted that the genetic/evolutionary origin of lucerne is in the near east centre of Vavilof and that the species developed in Asia Minor, Iran and the highlands of Turkmenistan. All these areas have cold winters and hot dry summers. The soil is well drained with an approximately neutral pH and has subsoils with deposits of calcium (lime). Sinskaya, a Russian, asserts that lucerne originated in two areas and that there was a second development in central Asia. Her reasons are that for many centuries there has been irrigation in these areas and that this is the possible origin of the resistance to fungal diseases of lucerne as well as the reason for the poor drought resistance of lucerne collections from these areas. At the same time they are resistant to bacterial wilt and stem nematodes. Medicago falcata L. or yellow-flowered lucerne has a wider distribution than ordinary lucerne and, through interspecies hybridisation, has contributed considerably to the greater adaptability of modern lucerne types. It is considered that when lucerne was introduced into Germany, as early as the 16th century, hybridisation had already occurred with M. falcata and that characteristics such as cold tolerance, drought tolerance, resistance to disease and decum-bent rhizomes were established in lucerne. This hybrid species, which was described as Medicago media, was the origin of many types such as German “Franconian” and, of great im-portance for South Africa, the French type known as “Provence”. We can thus see that natural hybridisation between the naturally occurring yellow lucerne and the “true” lucerne, which was spread by humans, led to many valuable types which were well adapted worldwide. The development or use of lucerne as fodder led to a highly successful cultivated crop. This success is probably due to the efficient root system of the plant and, coupled with this, its symbiosis with the nitrogen-fixing Rhizobium bacteria which reduce the plant’s dependence on soil nitrogen. The strongly developed taproot makes it possible to access water reserves as deep as six metres down, so that the plant can survive long droughts. WHERE DOES THE NAME LUCERNE COME FROM? The first description of the species by Tournefort places lucerne in the group Medica. This was later taken up by Linnaeus in 1735, who placed Medicago as a synonym of Medica. In his later publication, Species Plantarum (1753), he changed the sequence and made Medicago the main genus with Medica as a synonym. Botanists follow the 1753 classification of Linnaeus and common lucerne is known as Medicago sativa L.
Where common names are concerned, lucerne is known in Europe (except in Spain and Portugal), and in South Africa, Australia and New Zealand as lucerne, but in the rest of the world as alfalfa. 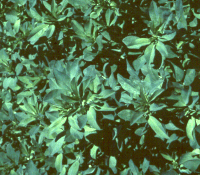 The use of the name alfalfa in Spain and Portugal may indicate a later independent introduction into those countries from North Africa. The name lucerne apparently comes from the first introductions into Europe which were established in Switzerland (Lake Luzern) while “alfalfa” means “good feed”. It is almost impossible to be definite about the distribution of lucerne but the oldest references to the species in historical records come from Turkey (approximately 1300 B.C.) and Babylon (about 700 B.C.). It is generally accepted that travel by sea was already well established in the eastern Mediterranean area as early as 4000 B.C. and that sea trade could have had an influence on the distribution of lucerne as early as this date. As well as this, the plains of Iraq were the meeting place of several trade routes of the peoples of Asia, Africa and Europe. In this way this fodder could have been in use from earliest times. The earliest written record of lucerne dates from more than 3300 years ago. There are clay tablets of the Hittites and from Turkey which state clearly that lucerne was used as winter feed for animals and also that it was regarded as highly nutritious. There are many indications that a millennium before Christ lucerne was already widespread in Persia, and in 400 B.C. Theophrastus described how the Medean armies brought lucerne to Greece as food for their horses. Many another writers, e.g. Aristotle (384-322 B.C. ), described lucerne, but until Roman times there was rather little information about distribution of the species. The Romans began using lucerne as a fodder about 200 B.C. and spread the species throughout Italy. They were also the first group who cultivated lucerne and there are documents about the sowing and management of lucerne as well as the making of hay. At the same time as lucerne arrived in Italy, there began a rapid worldwide spread of the species. In 126 B.C., the Chinese ruler Wu sent an expedition to Turkestan to obtain Persian horses. This army, among other things, brought back to China seed of the lucerne plants used to feed the horses and it soon became an important fodder in north China. By the time of the birth of Christ lucerne was already cultivated from north Africa to northern China and in large areas of Europe. During the time of the Roman empire (27 B.C. to 395 A.D.), the species spread further in Europe and was also brought inde-pendently to Andalusia and southern Spain. At this time it also was brought to Luzern Lake in central Switzerland. Although it might have reached southern France, it was only well established there at the beginning of the 13th century. After the fall of the Roman empire, lucerne disappeared from Italy and only spread much later to the rest of the world. Lucerne is a vigorous perennial legume with a well-developed taproot system. Plants differ greatly from each other and the most important cultivar characteristic for management and optimal use of lucerne, is dormancy. 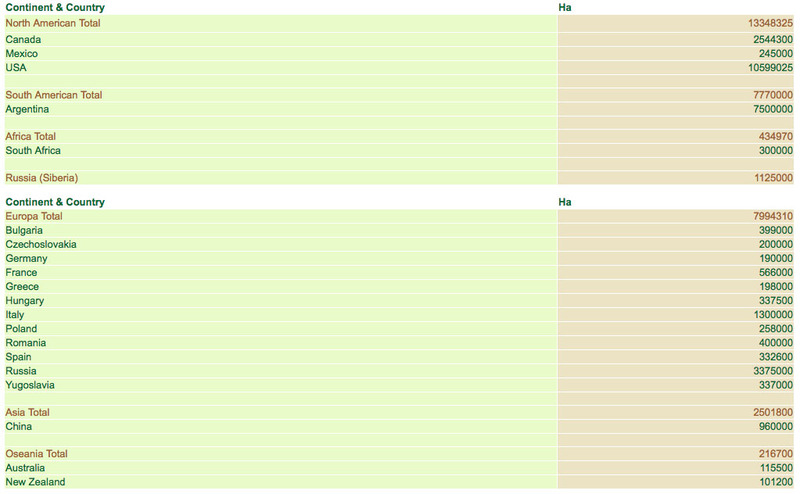 Cultivars vary from highly dormant to extremely non-dormant, and breeders classify them on a scale of 1 to 9 with 1 = highly dormant (adapted to very cold areas) and 9 = extremely non-dormant (adapted to warm favourable conditions – highly productive and suitable for 8-10 hay harvests per year). If one understands how lucerne grows then the yield can easily be maximised. The connection between yield, quality and carbohydrate reserves is critical for production of high-quality hay. Lucerne stores carbohydrates such as sugars and starch in the crown and roots. These reserves are then used for regrowth in the autumn and after each cut. When the lucerne is 15-20 cm high there are sufficient leaves to begin to augment the root reserves. This cycle is repeated after each harvest, i.e. reserves are first utilised, then re-stored. A high level of reserves ensures rapid and vigorous regrowth. Regrowth is always from the crown or at the base of old stems, and is initiated when the plant begins flowering. If harvesting is delayed, and flower-formation is already well under way, this regrowth may be damaged or cut off. Lucerne grows most rapidly up to early flowering stage, after which the growth rate slows and loss of leaves begins on the lower branches. Quality is thus highest during the early growth stage, when the ratio of leaves to stems is high. This ratio changes rapidly, and even at early flowering the pro-portion of stems is higher than leaves. The higher yield after flowering is thus often due to the large quantity of low-quality stems in the hay. If inter-cut intervals are lengthened, or the plants are cut when more mature, the yield increases but quality is considerably decreased. Lucerne seed consists of an embryo, cotyledons and a seedcoat (testa). It is contained in a pod and is usually kidney-shaped, but because of pressure in the pod it may become somewhat unevenly shaped. Mature seed is approximately 1-2 mm long, 1-2 mm wide and 1 mm thick. There are about 464 seeds per gram. The colour is either yellow or olive-green to brown, but white or black seeds may also occur. The seedcoat is covered with a mixed layer of fatty acids and waxes. A degree of hardseededness is the rule, where some seeds do not take up water. This is because the palisade cells in the seed are impermeable to water, and not the seedcoat itself. Mechanical scratching (scarification) of the seed is the best method of overcoming hardseededness. Lucerne seed may retain its viability for very long periods, and seed 70 years old had a germina-tion percentage of 7%, while a second sample had 30% germina-tion after 62 years. In South Africa, seed which was said to be more than 50 years old, was successfully germinated. When seed germinates, a primary (tap) root is produced which penetrates deeply into the soil. The first leaves are undivided (simple) while later-formed leaves have three leaflets, and certain “multileaf” types have five or seven leaflets per leaf. As the seedling grows, the primary stem (epicotyl) elongates, but the part of the stem between the cotyledons and the root (hypocotyl) shortens and may draw the cotyledons down to ground level or even under the soil surface. The first secondary stem forms in the axil of the first simple leaf, but later secondary stems may form in the axils of the cotyledons. It appears that seedlings of non-dormant cultivars form more se-condary stems in the cotyledonary axils than do dormant cultivars. 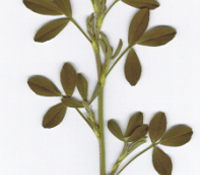 This group of stems, and the area from which they arise, forms the primary crown of the lucerne plant. The primary root – or taproot – is very strongly developed and can grow up to six metres long. The taproot, more specifically the root hairs, are invaded by Rhizobium bacteria, and this is very important for nitrogen fixation later in the life of the plant. The strong root system of lucerne, and its relationship with nitrogen-fixing bacteria, plays an important role in the ability of lucerne to survive and be productive in a wide range of climates. The crown of the lucerne plant forms from the area between the cotyledons (which are drawn into the soil after germination) and the first leaf. 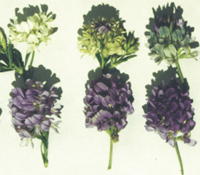 There is wide variation in the form of the crown, but in general the crown of non-dormant cultivars is not as compact as that of dormant cultivars. Non-dormant cultivars also often form side shoots above ground level. The crown of more dormant cultivars is often situated deeper in the soil and is thus more protected against trampling and mechanical damage than that of non-dormant cultivars. SA Standard has a cigar-shaped crown lying deep underground, presumably as a result of this cultivar being developed under grazing conditions. It also forms very strong side shoots below ground. This is the reason for the ability of our local cultivar to survive heavy grazing. Lucerne stems arise from the crown area and consist of nodes and internodes. The leaves, flowers and side-shoots are carried on the stems and form on the nodes. Stems are formed cyclically, and each cycle of growth is initiated when the stems begin flowering (anthesis). Understanding this property is important for optimising lucerne production. 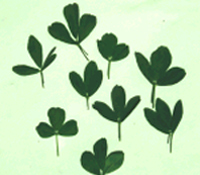 The leaves usually consist of three, sometimes five or seven, leaflets. The latter is known as “multileaf” and is often coupled to claims of higher quality. However, there is little evidence that quality is affected positively by this type of leaf. Leaves may be more or less hairy, and the degree of hairiness may have an effect on resistance to insects. Flowers are formed between the sixth and the fourteenth node of the stem when the plant changes from vegetative to reproductive growth. There are considerable differences between cultivars, which can be attributed to both environmental and genetic factors. The flowers are typical legume (pea) flowers, and must be insect pollinated. The keel of the flower is attached by a very stiff mechanism to the rest of the flower, with the result that when the style is depressed, the style (which is enclosed in the keel) springs out of the keel suddenly and bangs against the underside of the insect. This blow may be so hard that the insect is damaged, and if there are few pollinators to start with, pollination my be much reduced. In South Africa lucerne flowers are usually pollinated by honey-bees, but in America leafcutter bees are used. Leafcutter bees are not aggressive, and are exceptionally effective pollinators. Leafcutter bees have been domesticated in the USA, and a small but vigorous industry exists for supplying them to lucerne farmers. Lucerne does not grow under waterlogged conditions. It needs well-drained soil for optimal production. The optimal pH for lucerne cultivation is between 6.7 and 6.9. Soils need to be deep enough – at least 1.2 m – to hold a sufficient water reserve. Moderate to deep soil types are best, with a clay content of not more than 35%. Lucerne is adapted to a wide range of climatic conditions. Lucerne breeders have exploited this and have developed cultivars with different dormancy classes. For instance, under ideal conditions (a hot growing season with ample water or, if cultivated for hay, less rain) cultivars with a dormancy of 9 are required. Where there are factors that vary from this ideal, e.g. cool growing conditions, rainy weather, diseases and even grazing, the dormancy factor should be reduced. This has resulted in the use of cultivars with more resistance to various restricting factors, which give a more predictable yield.